The volunteers, hailing from 37 U.S. states, the District of Columbia, and Canada, worked Aug. 27-31 to complete 22 houses in a neighborhood of 23 Habitat homes for the 35th Carter Work Project. An annual Habitat for Humanity homebuilding program, the Carter Work Project occurs each year in a different location around the world. Overall, the 2018 Carter Work Project built or improved 41 homes in Mishawaka and South Bend, Indiana. “When I move in, I will be the first person in my family to ever own a home,” Bennett said of the house that will mark the end of multiple moves and provide stability for her family of three — not to mention air conditioning, a washer and dryer, a dishwasher, a garage, and private bedrooms for each of her children. “To have something that is ours, that we can be proud of, and that I can pass down to my kids, and to be able to say, ‘This is home. This is ours,’ is something that is really exciting for me,” said Bennett. According to the St. Joseph County chapter of Habitat for Humanity, the local organization that coordinated the build in Mishawaka, more than 14,000 of the county’s 100,000 households spend over 50 percent of their monthly income on housing. Nationally, the figure is 19 million families, said Jonathan Reckford, CEO of Habitat for Humanity International. Habitat for Humanity and the Carter Work Project are working to address that crisis by providing safe, affordable, and decent housing. The time Bennett spent building her home counted toward Habitat for Humanity’s 250 required hours of sweat equity. Habitat homeowners also must show they are financially capable of making monthly, no-interest mortgage payments. The Wells Fargo Housing Foundation supported this year’s Carter Work Project building program with a $250,000 donation from its National Housing Grant Program; $15,000 from its Team Member Volunteer Program; 65 volunteers; and 519.5 volunteer hours. The support is part of Wells Fargo’s pledge to increase its corporate giving to nonprofits to $400 million in 2018 — up 40 percent from 2017. “Wells Fargo has been such an important partner for Habitat for Humanity, and not just financially,” Reckford said. He noted both organizations have similar missions and are ”about building better communities, and in the same business of revitalizing and lifting up neighborhoods. “We’re grateful for the financial, volunteer, and leadership support from Wells Fargo, and the shared heart to make our communities stronger,” he said. Jeannetta Robinson, a registered client associate with Wells Fargo Advisors, was one of many local Well Fargo team members in Mishawaka who volunteered during the event. She wanted to repay her community for helping her when one of her children was born with cystic fibrosis. Wells Fargo team members like Robinson volunteered a record total 2 million hours in their communities in 2017, including 78,622 hours for Habitat. The Team Member Volunteer Program awards grants to team members for local projects that build or improve homes for low-income homeowners, seniors, veterans, and families. Team members in Mishawaka requested support and used their two days of paid community service from Wells Fargo to log nearly 92 volunteer hours between March and July, preparing the homes built during the Carter Work Project. Since 2010, the Wells Fargo Housing Foundation has donated more than $48 million to local Habitat for Humanity affiliates, as well as Habitat for Humanity International, while the company’s team members have volunteered more than 355,000 hours building and remodeling more than 2,400 Habitat homes. In 2018 alone, Wells Fargo will build more than 500 homes to help provide safe and affordable housing, said Martin Sundquist, head of the Wells Fargo Housing Foundation. Sundquist traveled to Mishawaka and joined Campbell; Mary Mack, head of Consumer Banking; and other team member volunteers. 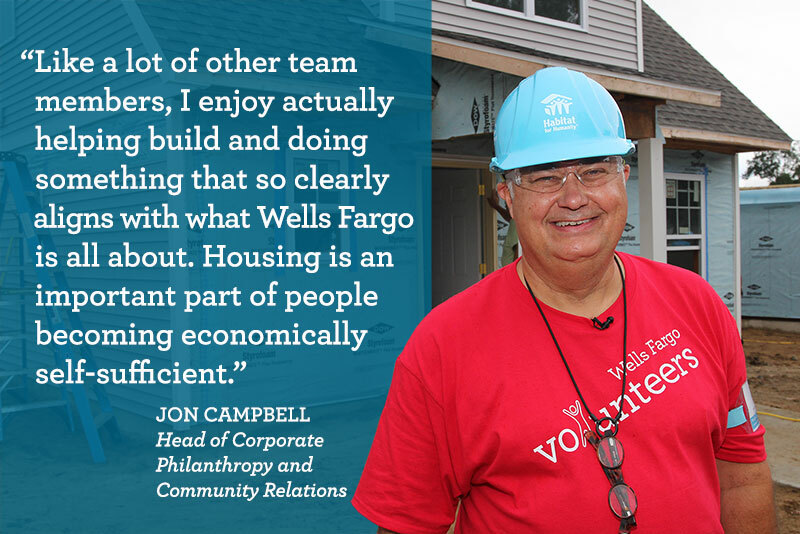 Working with Habitat for Humanity and the Carter Work Project advances Wells Fargo’s philanthropic goals to support diversity and inclusion, economic empowerment, and sustainability in communities. During the build, the Carters worked alongside other volunteers and inspired celebrities such as David Letterman, Garth Brooks, and Trisha Yearwood to pitch in and build as well. Over 35 years, the Carters and the project’s 100,000 volunteers have built, repaired, or renovated 4,290 homes in 14 countries. Next year, the Carter Work Project moves to Nashville, Tennessee. Each volunteer who worked onsite in Mishawaka received a blue T-shirt and hard hat. Christiana Smith-Shi turned heads with her blue hard hat as she brought it with her through security at the South Bend International Airport en route to Portland, Oregon — tired and sore but inspired by her first Carter Work Project experience. “It’s a special event in and of itself because, by the end of the week, you’ve created a whole new community of homes and become a community with the homeowners and volunteers,” Smith-Shi said. “But it’s especially poignant now, while we still have a chance to work side by side with former President and Mrs. Carter and really hear directly from them their thoughts and their long support of this organization and why they do it.